What is Project Angel Heart? 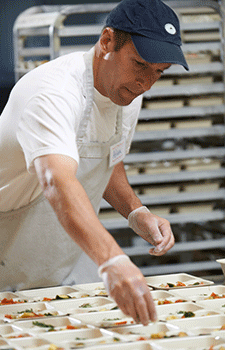 How is Project Angel Heart different from other meal service programs? What are the most common diseases reported by your clients? What is Project Angel Heart’s annual budget? How much of Project Angel Heart’s budget is allocated directly to the meal program? How many meals does Project Angel Heart deliver each year? Who does Project Angel Heart serve? How many people volunteer at Project Angel Heart? How does someone quality for Project Angel Heart meals? Project Angel Heart is a nonprofit organization that improves health and well-being for people with life-threatening illnesses by preparing and delivering medically tailored meals and promoting the power of food as medicine. Project Angel Heart is unique in that our meals are freshly prepared by professional chefs and modified to meet the medical and dietary needs of our clients. Our meals are always provided at no cost to recipients. Through our core program, we also deliver meals without age or income restriction. It takes more than $3 million per year to maintain the quality of our service and provide meals, free of charge, for those in need. Project Angel Heart relies on individuals for the majority of our funding. Additional funds come from foundations, corporations, and government grants. For the most recent audited financial statement, click here. Eighty-eight cents of every dollar of Project Angel Heart’s operating budget directly supports our client meal program, meaning that administrative and fundraising costs account for 12 percent of expenses. We are proud of that number but also believe that some administrative costs are essential to the continued success of our program. By investing in a solid infrastructure, new technology, and a well-trained staff, we believe that Project Angel Heart is better able to provide the medically tailored, nutritious meals that measurably improve quality of life for our clients. In 2019, Project Angel Heart will prepare and deliver nearly 500,000 medically tailored meals, at no cost, to 3,000 critically ill neighbors in the metro Denver area and Colorado Springs. Project Angel Heart has served children under the age of 5 as well as centenarians (people who are more than 100 years old! ), but more than half of our clients are over the age of 60. Eighty percent live in the Denver metro area, and 20% live in Colorado Springs. Most are economically as well as medically vulnerable, with nearly two-thirds living at or below 125% of the federal poverty level. While most people who receive our meals are living with a life-threatening illness, we also provide meals to dependents of those who are eligible for our home-delivered meal service. To see more information about who receives Project Angel Heart’s meals, check out our annual report. Each year, nearly 8,000 volunteers donate more than 65,000 hours of their time, essentially doubling our staff capacity. They drive tens of thousands of miles to deliver meals to clients, work in our kitchen, provided administrative support, and volunteer at special events. For more information on volunteering, click here. How does someone qualify for Project Angel Heart meals? We deliver to anyone living with a current diagnosis of a life-threatening illness such as cancer, HIV/AIDS, end-stage renal disease, congestive heart failure, multiple sclerosis, or another illness who has documented difficulty preparing or accessing healthy meals due to treatment, side effects, ambulation difficulties, or another disability. We do not qualify people based on age or income. For more information on how to receive meals, contact our Client Services department at 303.830.0202 or click here to download our application.